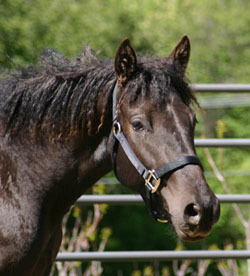 ‘Flitty’ is a beautiful smokey black, curly coated filly, from Damele and Warrior lines. She carries the cream gene, which makes her the colour of milk chocolate. She has a lovely free shoulder and great suspension, making her a dressage prospect in the future. Flitty arrived at Trevor Hall Farm in the summer of 2009 and produced a lovely smooth coated filly to to Creekside Curlies' wonderful coloured stallion Heartbreaker. We had another beautiful curly grulla filly by reining stallion, Freckles Dun Chic. Fifi is staying with us as a riding and future broodmare. Flitty is another fine example of the curly horse, with a loveable character and wonderful generous spirit and her liberty & groundwork are excellent. Riding has proven to be more challenging for Flitty and we have decided it fairer on her to only work with her on the ground and at liberty. She is easy to do in all aspects, but fearful when ridden. Something which is not exhibited in either of her foals.